VIP Glasgow Opened In February 2014. Award winning VIP offers Every Aspect of hair and beauty treatments in our Prime Celebrity Hot Spot Salon. 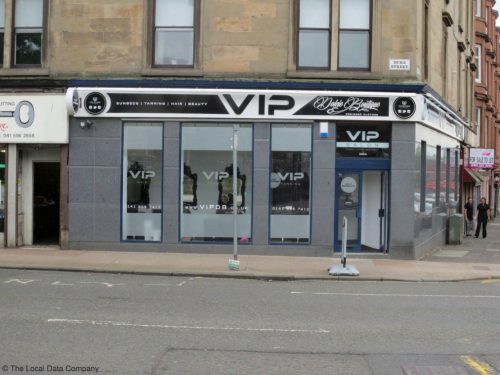 We are located in trendy upmarket Duke Street Dennistoun in the heart of Glasgow’s East End, 6 months after opening our Doors VIP won Fake Bake Salon of The Year. VIP Glasgow are sroud to be Scotland’s one and only No 1 one stop shop, where have state of the art sunbeds and offer treatments such as Make Up, Hair Waxing, Hair Extensions, Nails and much more by our highly Trained Team. I travelled the world to amazing places such as Ibiza, Marbella, Miami, London and Dubai and visited all the major celebrity hotspots to do my research and brought the VIP scene back to Glasgow which has inspired me to take my brand VIP worldwide. At VIP Glasgow you can relax and enjoy your treatments in our trendy salon with our complimentary Champagne Bar and appreciate our high end products and outstanding Customer Service. VIP also has a fashion boutique called Dolcie were we sell and rent Luxury Red carpet Gowns perfect for any VIP occasion. We work with luxury fashion brands such as Jovani and Angel forever Couture . VIP Glasgow has featured on TV documentary such as How Scotland Works I was also a judge on Glasgow’s Reality TV show Glow and many more. My main achievement to date was being a candidate for the BBC The Apprentice 2016.